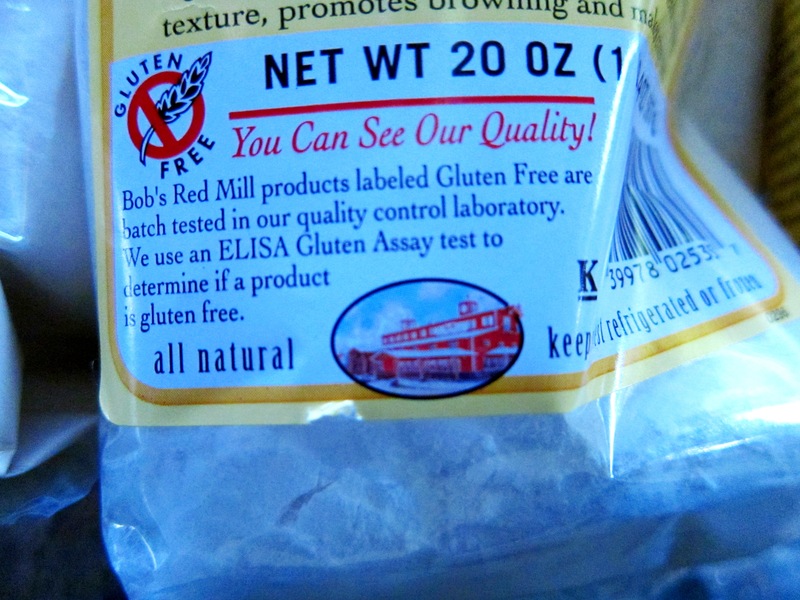 So, one of my best friends, Sheva, has an allergy to gluten. Thus, whenever I go on one of my cupcakes or baking escapades, she, unfortunately, cannot partake. So we made a dinner date last night. She made an amazing egg drop soup, and my job was to make a gluten free dessert. Of course, I really wanted to make a cupcake. So I did some research and headed over to Whole Foods. So the key ingredient was Xanthan Gum. 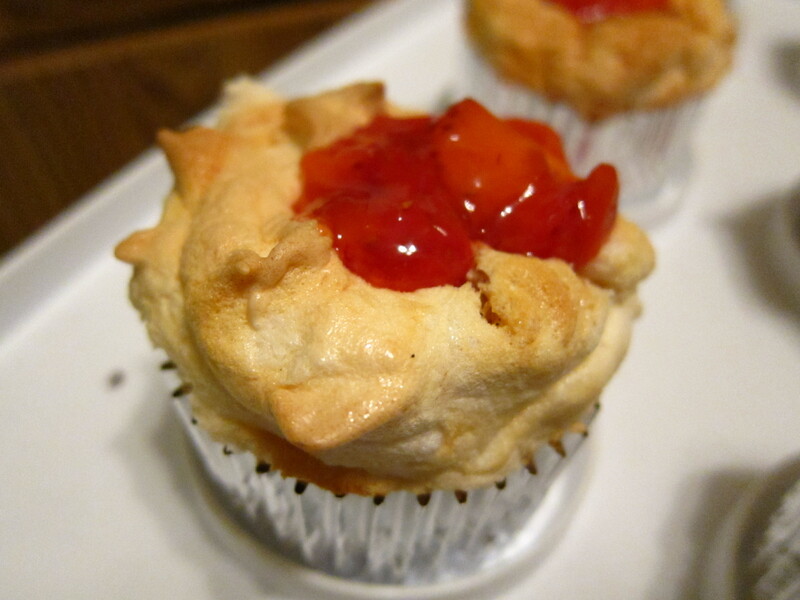 When you take the gluten out of cupcake batter the stickiness goes away. This stickiness is key because it binds the ingredients together. So what do we do? Xanthan Gum! It brings the stickiness 🙂 I chose to use White rice flour and Tapioca flour because they both have really good things bring to texture. White Rice flour brings a lightness and a sponginess to baked goods. 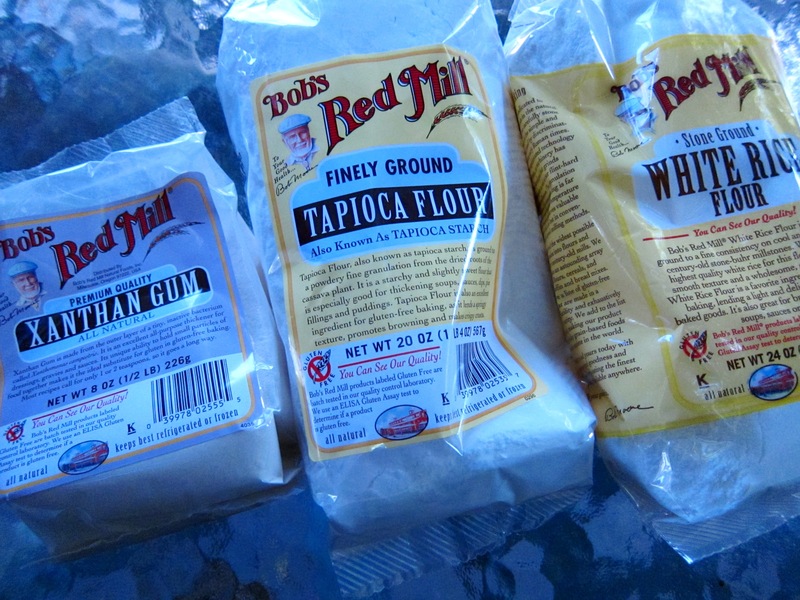 Tapioca flour brings a springiness to baked goods. 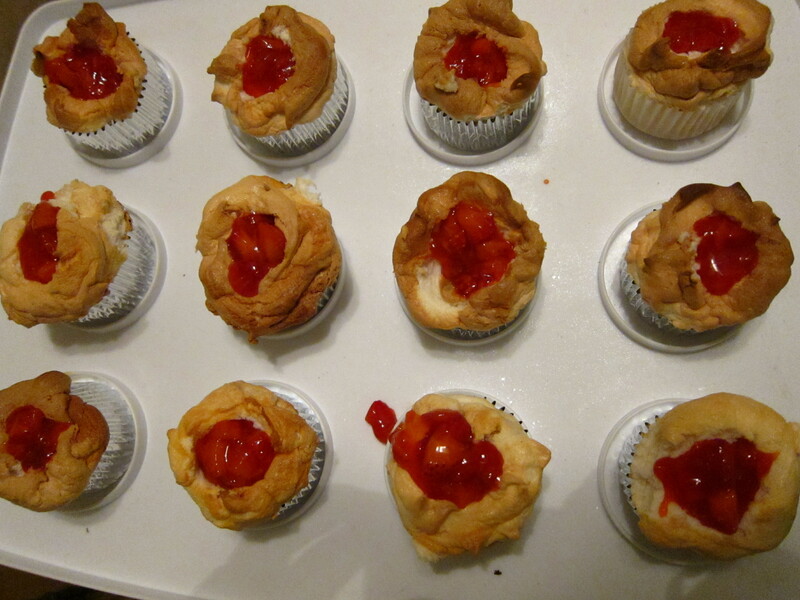 So, I should have done this [and this is the reason my cupcakes look a bit more “rustic” than they look “put together” lol], but I was rushed for time, place the batter into a pastry bag with a big round tip and pipe the batter into the cupcake wrappers. The batter will rise slightly. 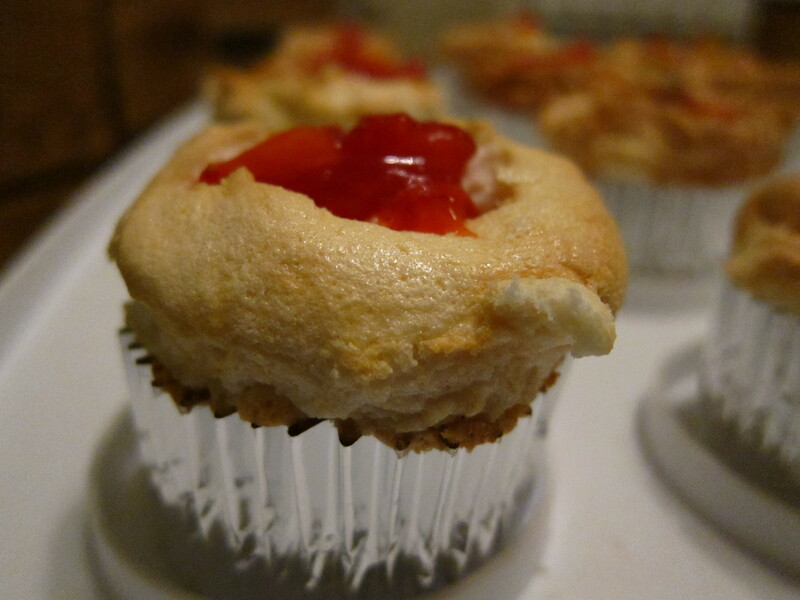 You can put the batter up the rim of the cupcake holes or even slightly higher [I tried both]. Then, bake! 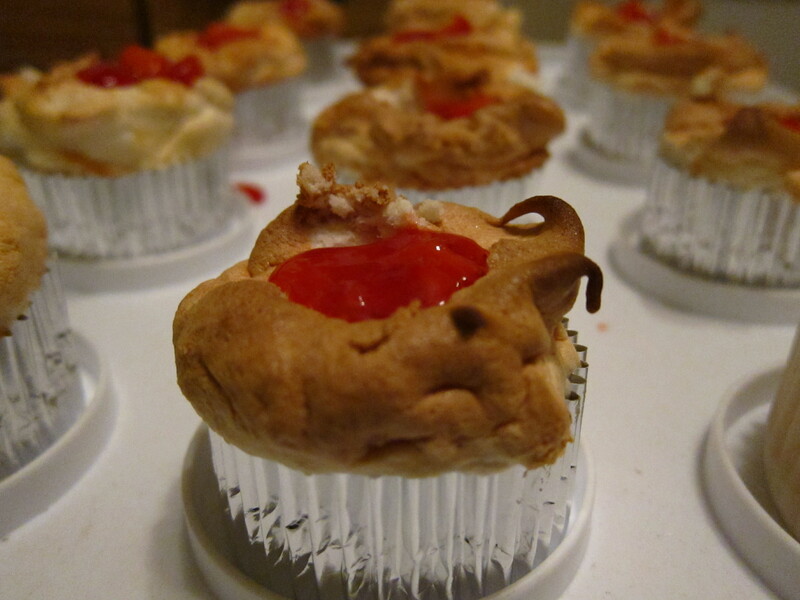 I decided to spice up the cupcakes and fill them with a simple yummy strawberry filling. 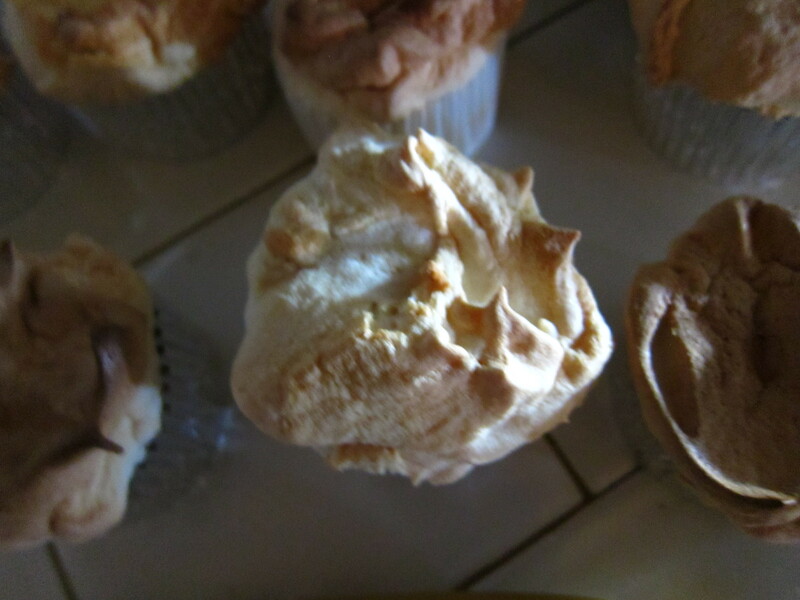 Then I topped the cupcakes with a very light whipped cream [just so you know, I hate sweet whipped cream; so when I make whipped cream I put in at most 1 tbsp of powdered sugar or splenda (whichever you’re going for :p) if any sweetness enhancer at all]. 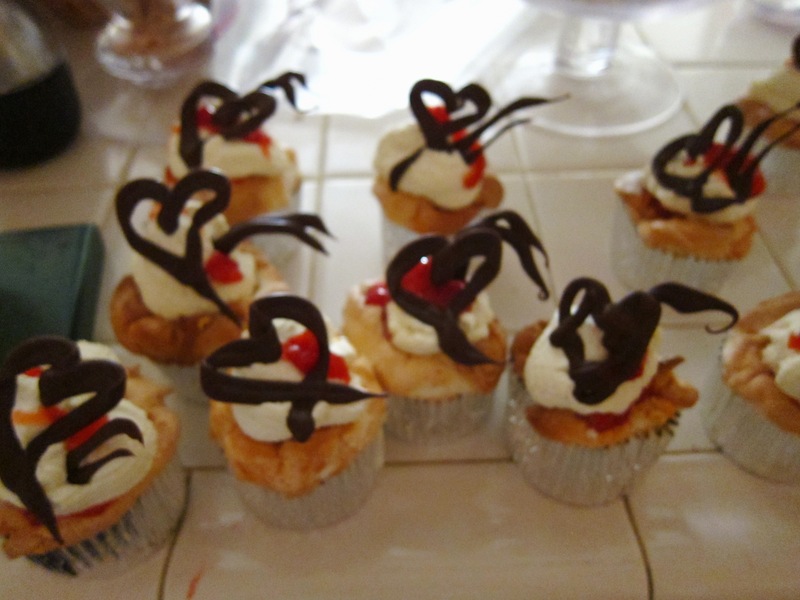 So there are two ways that I decorated the cupcakes. 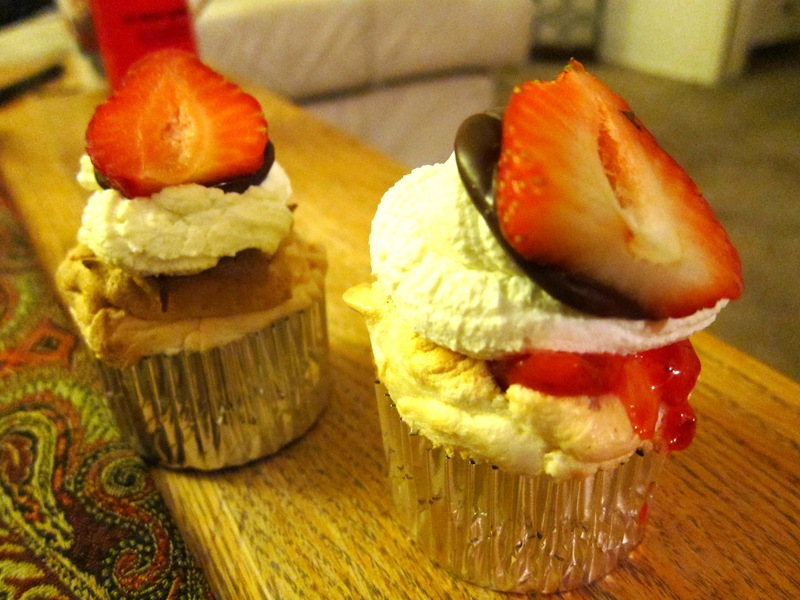 When I took some of the cupcakes to Sheva’s, I filled them with the strawberry filling, then topped it with whipped cream. 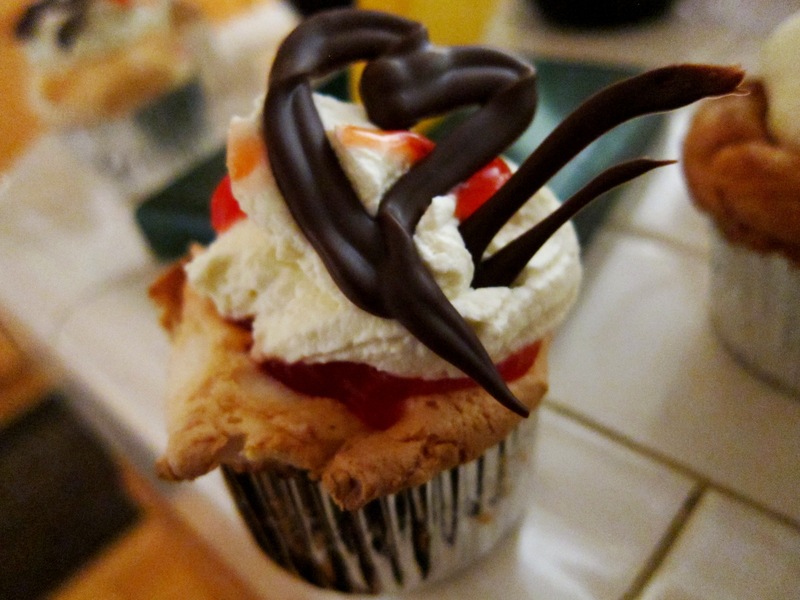 Then, I swished some dark chocolate candy melts on some wax paper and placed slices of strawberries on the chocolate and then used them as toppers. 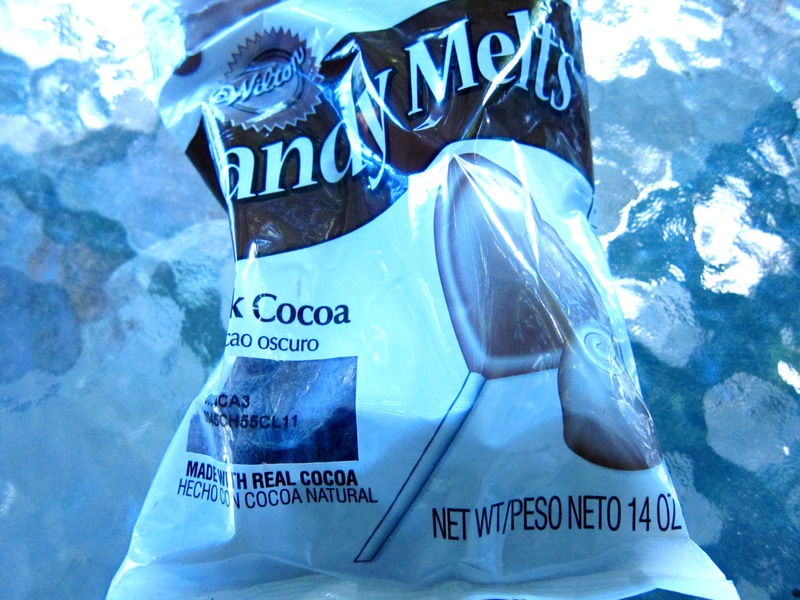 These are Wilton Candy Melts. I really like these. They are really really easy to use. You pour some in a heat proof bowl and microwave until it’s melted. Then wait a little till the chocolate cools and pour it in a pastry bag. Either attach a very small round tip or even snip a piece off of the pastry tip. Lay out a piece of wax paper and then decorate any shapes that you’d like on the wax paper. Since I was in a rush, I placed the wax paper in the fridge so that the chocolate could cool in a minute. The candy melts are really cool because they will completely cool on their own in a few minutes [I just really had no time because I had to go to class so I sped up the process in the fridge :)]. 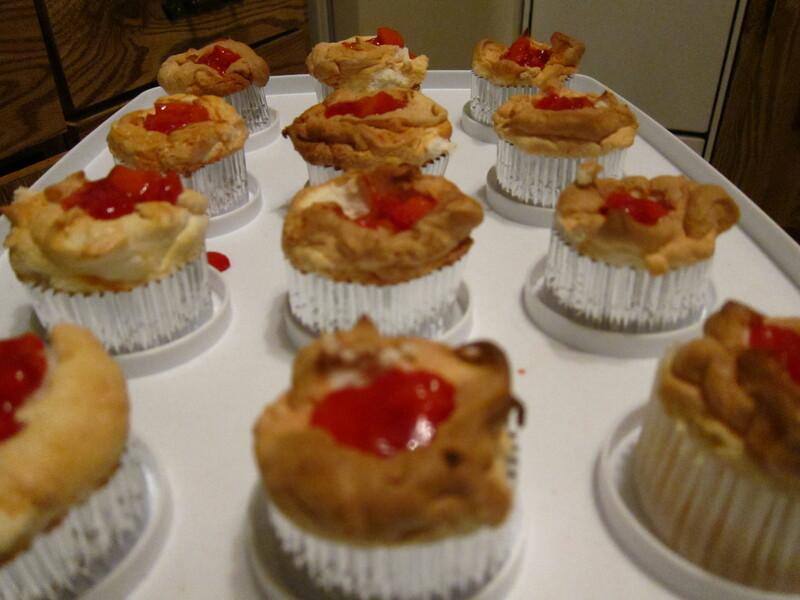 Needless to say, they were yummy and deliciously gluten free! Preheat oven to 325 degrees. 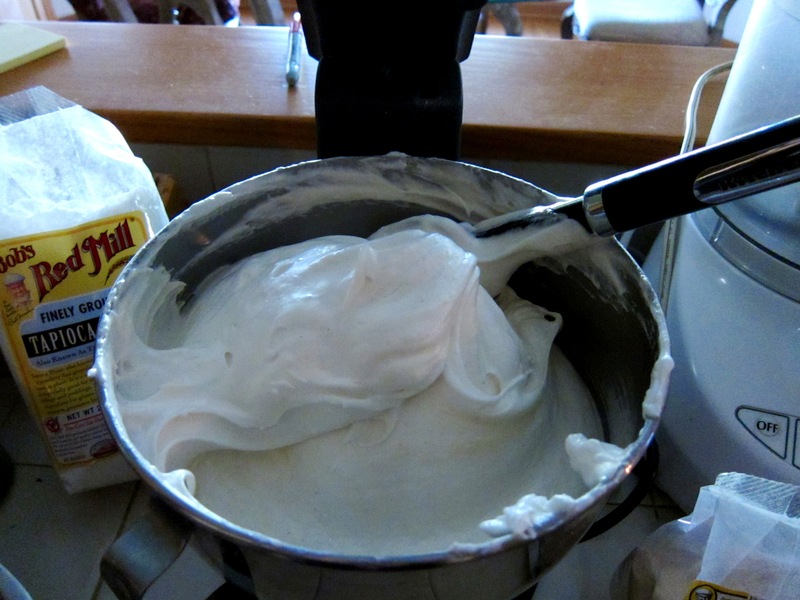 Separate egg whites in a stainless steel bowl and let them come to room temperature. In a separate medium bowl, sift gluten free flour, salt, xanthan gum, and 3/4 cup of sugar. 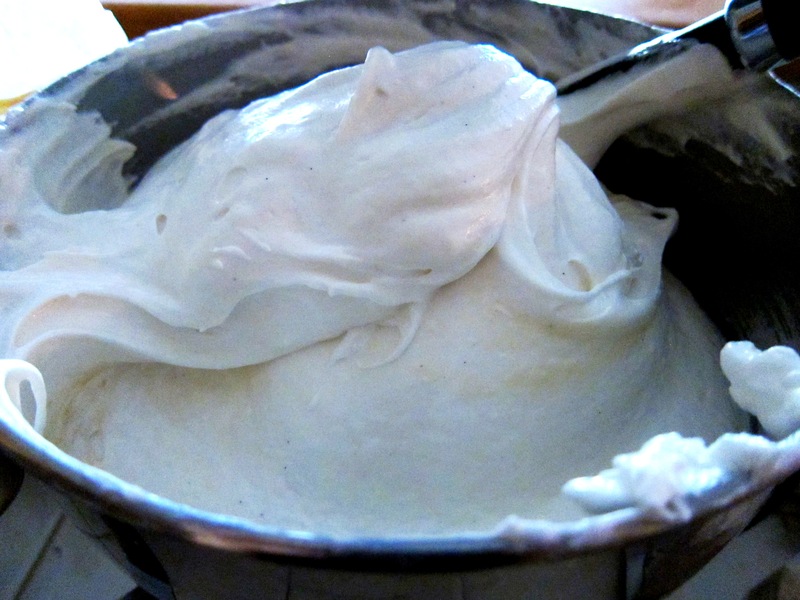 Beat the egg whites until foamy. Add the cream of tartar. 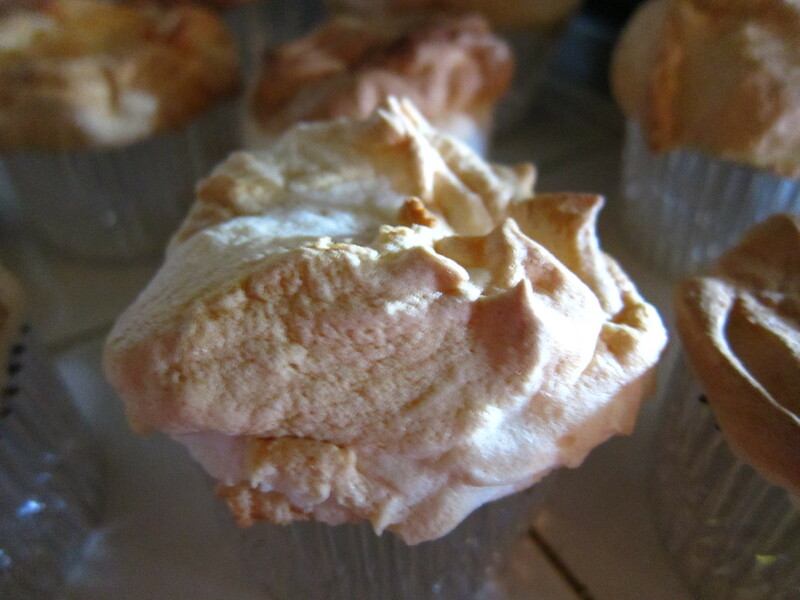 Beat until the egg whites form soft peaks. Beat in the other reserved 3/4 cup of sugar about 3 Tablespoons at a time. Beat until stiff peaks form. Slowly fold in flour mixture about 1/4 cup at a time. Once the flour mixture is combined, fold in the vanilla. 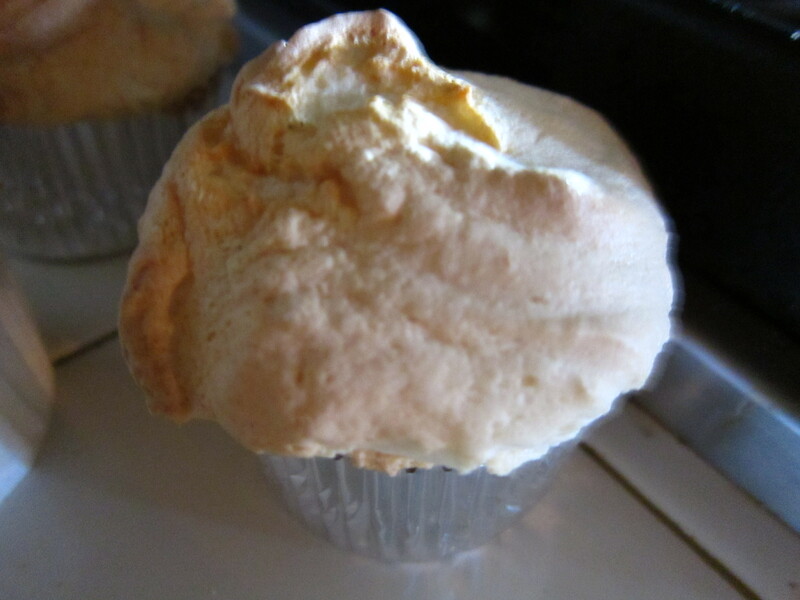 Pipe the batter into the cupcake wrappers up to the rim or a little above. Bake for 30-45 minutes; until the tops are golden and they spring back when you push on them. Take them out and let them cool at least 10 minutes. 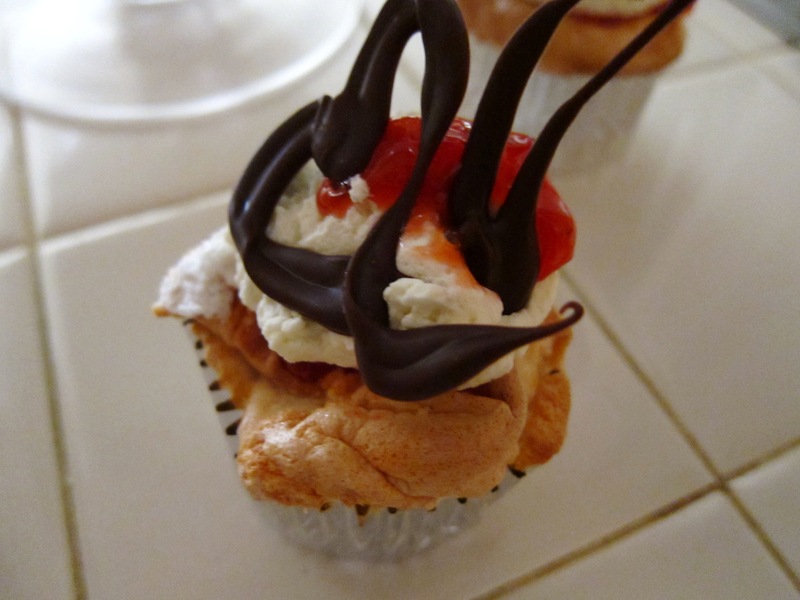 Cut cones out of them and fill them with filling, top with whipped cream and any decorations you’ve made. Rinse, hull and slice the strawberries. Place a quarter of the berries in a saucepan with the sugar and bring to boil. In a bowl, combine the lemon juice, kirsch and cornstarch and stir together till smooth. Take the saucepan of berries off the heat and stir the cornstarch mixture into it. Return to heat and bring back to a boil, stirring and cook for 2 minutes. 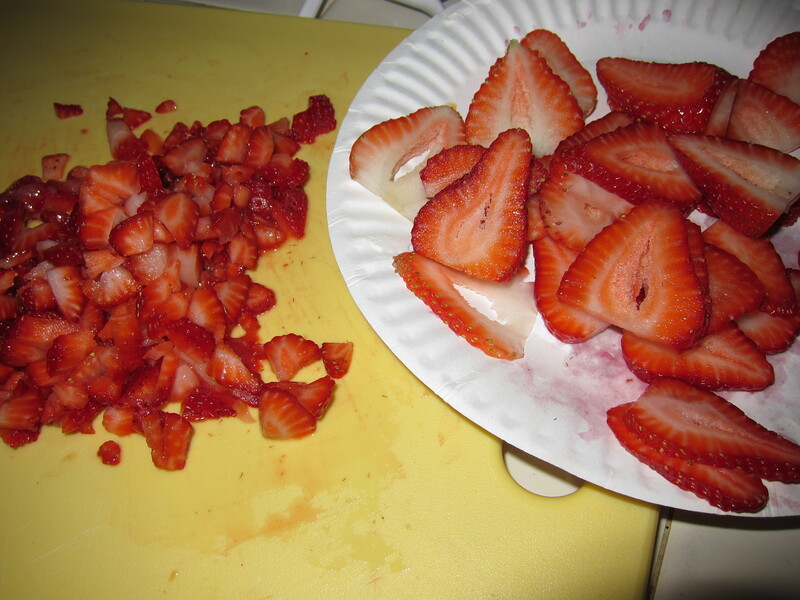 Remove from the heat, cool and then stir in the remaining sliced berries. 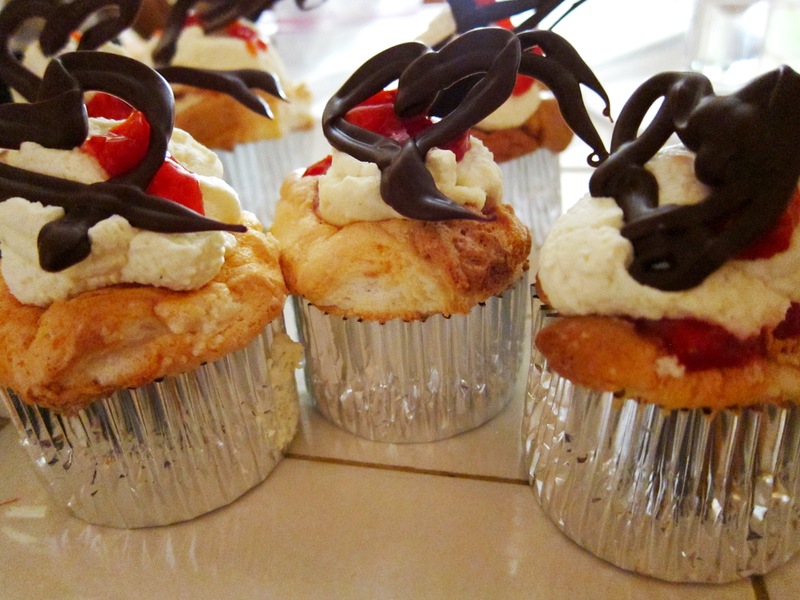 Do you prefer foil or paper cupcake liners?